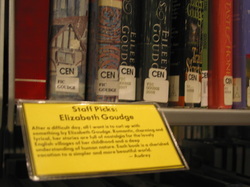 During my time as a readers' advisor at Seattle Public Library, in addition to providing readers advisory from across our collection, in literary fiction, mystery, romance, westerns, science fiction, short stories, nonfiction, and teen fiction, I also created some passive readers’ advisory tools. In order to draw attention to authors with poor circulation numbers, I created a few “shelf talkers” such as this one. One of my colleagues commented on the success of this project.